Stems: Erect, sparingly branched above, stout, velvety. Leaves: Alternate, simple, long-stalked, nearly circular to ovate, 1.5-7 inches long, 2-8 inches wide, covered with velvety, star-shaped hairs; bases heart-shaped; margins shallow to sharply toothed, tips tapering to points; leaves often drooping in hot weather. Inflorescences: Solitary flowers, mostly in upper leaf axils. Flowers: To 1 inch wide, on stalks 1/2 to 2 inches long; calyces 5-parted, lobes ovate, velvety; petals 5, yellowish orange; stamens numerous, filaments united. Fruits: Schizocarp, capsule-like, fluted, 10-15-segmented; seeds 2 or more per segment, heart-shaped, flat, black. Habitat: Waste areas, roadsides, pastures, cultivated fields, and gardens. Distribution: Principally east half of Kansas. Origin: This native of southern Asia was introduced into North America around the beginning of the 19th Century. Uses: In China, fiber from this plant was used to make cords, thread, and nets. Quail eat the seeds. 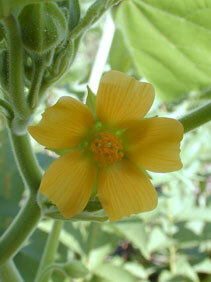 Comments: Velvetleaf is a common weed whose seeds can remain viable in the soil for more than 50 years.